Whether you’re renting out your home or an investment property, you have a lot to worry about. And highest on that list is probably property damage, whether from natural forces or lousy tenants. To help, we’ve put together a ton of information about the process of filing a claim so you know exactly what to do before, during and after a less-than-ideal situation. If you’re ever unsure of what to do, give your insurance agent a holler and follow these steps toward a smooooooth claim process. Whether something bad just happened to your property or you’re just trying to educate yourself before something does, these are the first steps you’ll need to take if an accident occurs. NOTE: If the damage is structural, use caution when shuffling through the mess and make sure all tenants are safe. Step 2: If needed, call the police. If the house has been burglarized, let the police know when it happened and what was stolen. Step 3: Document any damage. Take photos and videos of the damage, and write down what’s been destroyed or taken. Step 4: Contact your insurance agent. Get in touch with your insurance agent and let them guide you through the next steps. Step 5: Prepare for an adjuster to come. Don’t move or touch anything until an adjuster can come assess the damage. When it comes to insurance claims, there is an unofficial “ideal claim zone.” In this magical zone, the juice is worth the squeeze. In other words, the cost of the damage significantly outweighs your deductible, and filing a claim IS worth it. But if your expenses are just a hair above your deductible, it is probably not worth the risk of your premium going up. If your home has been damaged by weather, fire, burglary or vandalism. If a tenant has caused significant damage to your property. If a tenant or visitor is injured on your property and it will result in high medical bills. If a tenant files a lawsuit against you for injuries sustained on your property. 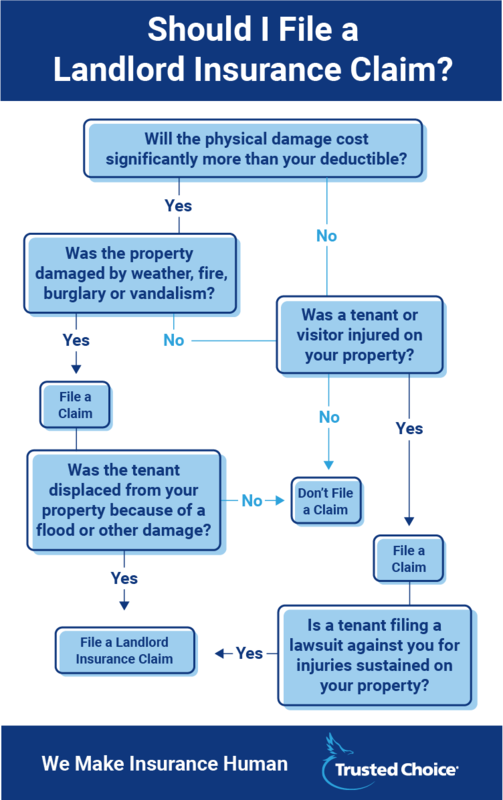 If a tenant has been displaced because of a flood or other damage. Planning ahead can make the claims process go much more smoothly. Preparation should start from the day you buy the property. Taking a few extra steps can make a huge difference in how the claims process goes. Make a video of your belongings. Narrate throughout the video and mention how long you’ve had significant items and where you bought them. Being super-organized and overprepared for an unlikely situation is key. But there are a few extra tricks that landlords can think about to help protect themselves even further in the event of a bad situation. Have an indemnification in your lease. If you get sued because of something that your tenant did in your home, an indemnification obliges the tenant to pay. Require the tenant to have renters insurance. If the house catches on fire or someone steals all your tenant’s belongings, they’ll need renters insurance to cover their possessions. The key to having a smooth claims process is being prepared beforehand and cooperative afterhand. The more accommodating and organized you can be as a landlord, the easier the process will be. Contact an insurance agent today.